The Staybridge Suites Dallas Fort Worth Airport North is now accepting reservations for arrivals after November 18, 2008. A luxurious jewel in the heart of Irving/Las Colinas, surrounded by Dallas, Grapevine, and the Galleria. 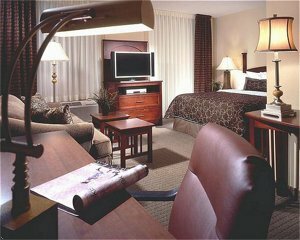 The newest Staybridge Suites DFW Airport offers the comfort of luxury, tradition and sophistication. The hotel is conveniently located between Dallas and Fort Worth. Surrounded by restaurants, minutes from shopping, and just a few miles from the DFW International Airport. In addition, we are in close proximity to Dallas World Trade Center, Dallas Convention Center and Gaylord Texan.This hotel has all the amenities for today's business, leisure and family travelers. State-of-the-art fitness center, I-Home radio, flat screen TVs, complimentary wired and wireless Internet, complete kitchen in every room, home theater, sports court, grill. For leisure or corporate travelers, we recommend visiting the following attractions: Six Flags Over Texas, Hurricane Harbor, Texas Stadium, Texas Rangers Stadium, American Airlines Center, Movie Studios of Las Colinas, and Grapevine Mills Malls, all within a close proximity of the hotel. Come enjoy the complimentary Sundowner Evening Reception with us and mingle with other guests. In addition, we'll see you in the morning for our hot, free breakfast buffet! This hotel is committed to providing accessible facilities under the American Disabilities Act. If your accessibility needs are not met, please contact the Hotel Manager on Duty. Should you require additional information regarding accessible facilities for guests with disabilities, please call 1-800-Holiday (U.S. and Canada) or contact the hotel directly. For the hearing impaired, TDD service is available at 1-800-238-5544 within the U.S. and Canada.